It's the change of hands time for our long-term Apache 200, and I'm the lucky one to get the keys after my TVS Victor went back to its maker. Now, I have to be honest; I've been yearning to keep the Apache as my long-term motorcycle ever since it was introduced in our fleet. I love its streetfighter looks, and the matte yellow paint simply adds to the attractiveness of the bike. So, the first thing I did after collecting the bike from our office is take it to the pressure wash. I prefer my motorcycles clean, and the wash brought out that lovely matte yellow lustre that gleamed in the sun. Another feature I love is the large white backlit instrument console. Besides looking ultracool in the dark, the console offers a ton of information. That said, I wish the numbers on the rpm meter were a little larger as it's a bit difficult to take a quick glance at the engine revs, particularly at high speeds. Scrolling through the other features on the instrument console, what got my attention is the 0-60kmph timer and the lap timer. 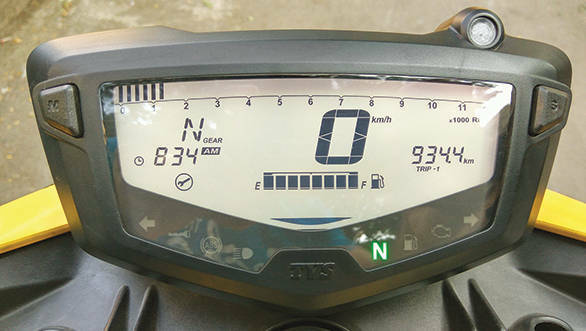 While the latter is of no use, unless I manage to squeeze in a track day with the bike, the 0-60kmph timer will be more than handy to practise acceleration runs. My commute to and from work have been quite interesting during these initial weeks. 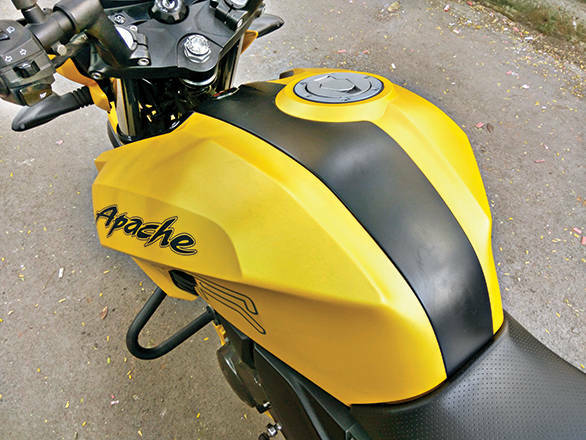 For starters, the nimble nature of the Apache allows me to own every gap on the road, aided by the crisp fuelling of the fuel-injection (FI) system that allows for precise throttle inputs. And then there's the sweet sound from the exhaust. 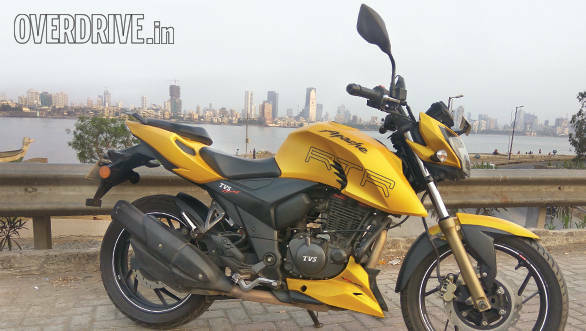 The TVS guys have done a superb job of tuning the exhaust note, and it sounds almost as if it belongs to a twin-cylinder motorcycle. In fact, a lot of people at traffic lights have stopped to enquire if I've modified the exhaust. I wish I had a way to show you guys their reaction when I tell them it is a stock exhaust! All that riding in the heat and dust though has taken its toll on the matte finish, and it is quite a task to get the stains off. I think a quick round of polish at the next service should take care of this. I also plan to discover the handling prowess of the Apache in the coming weeks. I've heard a lot about the bike's handling, and I can't wait to explore its potential.